Faber-Castell Polychromos Pencil on 8 X 10 in. Pin-up Girl No. 13 doing some yard work. The weather here in Minnesota is unseasonably warm which has people thinking about spring. Of course those of us who've lived here long enough know this warm weather won't last, not in January, not in Minnesota. 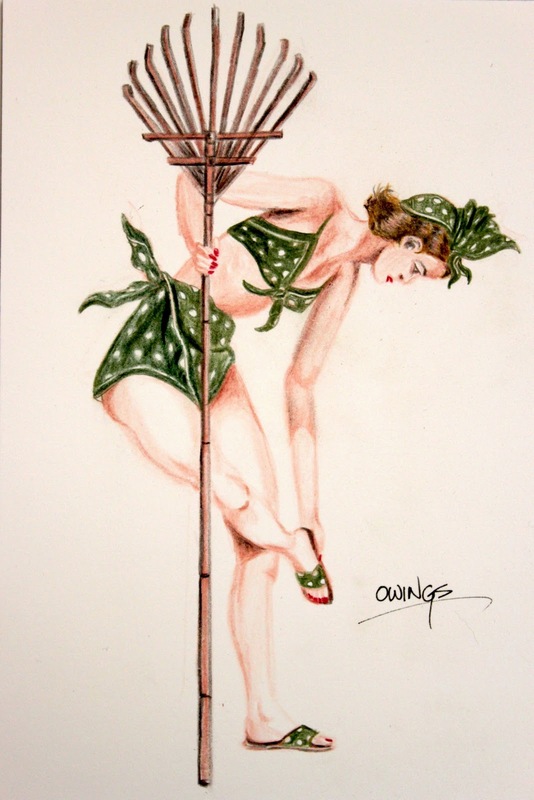 At any rate here is today's Pin-up in all her yard raking glory. I used Faber-Castell polychromos pencils to render this drawing. I really like the green, reminds me of the 1940's era. This drawing took about an hour to complete. Just seven more pin-up's left in the project. Feel free to leave a comment below if you care to and don't forget to click follow if you want to follow this blog.